This chapter discusses the potential of social software and Web 2.0 tools to enhance language learning in a blended learning context. It describes an English as a Foreign Language course that introduces students to several Web 2.0 tools with the aim of helping them develop their own Personal Learning Environment. As students become familiar with the almost endless opportunities for accessing and participating in authentic language on the Web today, they must also learn to find appropriate resources, filter unsuitable materials, manage this information overload, and decide which tools best suit their own learning style. The chapter argues that accompanied with the right pedagogical approach, these tools enhance learning by allowing students to engage in self-directed learning and gain skills and resources that are transferable to their informal, lifelong language learning. Developments in Computer-Assisted Language Learning (CALL) theory and practice are inherently connected to evolutions in technology and societal changes (Kern & Warschauer, 2000). The first phase of CALL in the 1960s and 1970s adopted a structural approach to language learning and was characterized by drill and practice methods. The most advanced technology available at the time was the mainframe computer, which was suited to these methods. By the end of the 1970s, behaviouristic approaches had been rejected in favour of communicative approaches to language learning based on cognitive/constructivist views of learning. These changes were accompanied by the advent of the personal computer, and at the end of the decade multi-media CDs and other software. Learners were encouraged to interact with the computer or to use computer-based tasks as stimuli for learner-learner interaction. The focus was no longer on merely learning form but on learning how to use forms. Though educators felt this was progress, by the end of the 1980s they were calling for more integrative methods for teaching languages that could take into account the many different aspects of the language learning process from form to communication to culture. The advent of the Internet in the 1990s made a shift towards integrative, sociocognitive approaches possible. The Internet allowed educators to implement Computer Mediated Communication (CMC) in their classrooms which led to a shift “from learner’s interaction with computers to interaction with other humans via the computer” (Kern & Warschauer, 2000, p. 11). In 1996, Warschauer (1996) claimed that CMC via the Internet was “the single computer application to date with the greatest impact on language teaching” (p. 9). Indeed the technology-centred approaches that characterized both the first two phases of CALL failed to provide the “killer” application for teaching and learning processes that would transform language learning (Cuban, 1986) just as time has proven that computers-as-tutors cannot replace teachers (Cognition and Technology Group at Vanderbilt, 1996). On the other hand, the learner-centred approach that characterizes the third phase can “help students and teachers to learn and teach through the aid of technology with a focus on how ICT can be used as an aid to human cognition and consistent with the way the mind works solving complex tasks and dealing with today’s information overflow” (Petrucco, in press). At the turn of the century, the way the Web was used began to change significantly: rather than a place where information was merely made accessible, it was becoming a space where knowledge was being created. Users, everyday people, began to produce content and global communities of users sharing knowledge or just similar interests began to develop. Millions of software developers around the globe were voluntarily writing the code for open source software programs such as the operating system Linux and the web server Apache, which would rival proprietary software. Universities, such as MIT and Stanford, began to publish course content and lectures on websites open to the public. In other words, a revolution characterized by sharing, openness and co-creation was taking place. 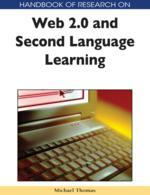 In 2003, Tim O’Reilly and Dale Dougherty dubbed this new revolution “Web 2.0” (O’Reilly, 2005). Some argue that the term is superfluous and that the Web today is simply an evolution of what it originally was. In a podcast interview, Tim Berners-Lee, the creator of the World Wide Web, stated: “If Web 2.0 for you is blogs and wikis, then that is people to people. But that was what the Web was supposed to be all along” (Laningham, 2006). Regardless of whether or not the term is used, the point is that the way regular users can contribute to the Web has changed. Berners-Lee goes on to explain that for some people Web 2.0 “means moving some of the thinking client side so making it more immediate” and it is just this immediacy and ease with which users can generate content on the Web and participate in online communities that will define what is called Web 2.0 in this chapter. Feed Aggregators: A feed aggregator is a client software that allows users to receive syndicated web content from any type of website that uses feeds, such as newspaper websites, blogs, podcasts, etc. In other words, rather than having to regularly check websites for updated information, through the use of feeds (RSS, XML RSD, XML Atom), updated information is sent to the feed aggregator so that users have only one place to check for updated content. Users can decide how much of the updated information they would like to receive in the aggregator, e.g. a few lines or the entire text, and whether or not to receive just text or other media as well. Users can also go directly to the websites from the aggregator. Feed aggregators provide a useful tool for managing the information overload on the Internet. Social Software: A generic term used to describe different types of software that enable people to collaborate and create and join online communities. The tools can promote different types of communication: synchronous one-to-one (instant messaging), synchronous one-to-many (Skypecasts), asynchronous one-to-many (blogs), asynchronous many-to-many (wikis), or asynchronous many-to-one (feed aggregators). These tools allow users to share and create content, collaboratively create and edit content and/or manage content. Blog: Simply defined a blog, or weblog, is a sort of online journal organized in reverse chronological order where a person writes about their thoughts and interests, including providing links to relevant resources on the Web. Most blogs allow readers to leave comments. There are many different types of blogs from very personal journals to educational blogs. Different types of media from audio to video to images can often be integrated into a text blog. A blog may have one author only or several authors. Podcast: A podcast is the distribution of audio files over the Internet using syndication feeds such as RSS so that users can subscribe to the podcast using feed aggregators to be notified when new content is added or so-called “podcatchers” such as iTunes or Juice which automatically download new content. Once downloaded the content can be played back using portable media players or personal computers. Although podcasts can often be listened to in streaming, what differentiates them from other online audio files is that they can be downloaded, are updated regularly and updates can be read by feed aggregators or podcatchers. Social Bookmarking: Social bookmarking websites allow users to store, classify, share and search their own Internet bookmarks, as well as those of other community members, through using tags (folksonomies). Most services offer remote hosting so that users can access their bookmarks from any computer. Social bookmarking can serve as a filter for the information overload on the Internet. When users search on these websites, they are not searching the entire Web using an algorithm, as is the case on most search engines, but rather viewing websites other users have found to be useful, and taken the time to save, describe and choose semantically classified tags for. Informal Learning: Informal learning is learning that takes place outside of institutionally defined contexts, for example learning on the job and in one’s personal life. It can be associated with other concepts such as lifelong and continuous learning, both of which are becoming more important in today’s information society. Web 2.0: Although there is still controversy over the term, Web 2.0 is generally used to contrast the World Wide Web in the 1990s as a collection of websites produced by experts, institutions and companies (the read-only Web) with the changes that took place starting with the twenty-first century where Web applications allow end users to create and share content on the Web (the read-write Web). Personal Learning Environment (PLE): Although there is not to date a fully agreed-upon definition of this term, in this context it refers both to the set of web-based tools that are used to aggregate content and produce content on the Web as well as to the personal experiences and processes that lead to learning. An individual has control over the tools and contents of his/her PLE, which is not limited to a given course or learning context (e.g. school or university) but may continue to grow and change throughout the learner’s life.